After being bought by Jumia, Kaymu was rebranded to Jumia Market, Kaymu – Nigeria’s largest online social marketplace, has rolled out an affiliate program which not only rewards affiliates for driving sales, but also reward them for referring affiliates. Besides that, you will earn N500 instantly if you sign up as an affiliate and your application is approved. When you sign up for Jumia market affiliate program (N500)When you refer anyone to buy from Jumia market and the person buys via your unique affiliate link (N700 per sale) When Kaymu approves an affiliate that joins the affiliate program through you. (N300 per referred Affiliate)According to the Jumia market affiliate manager, you will earn flat commission of N700 per product you sell through your affiliate link irrespective of the price of the item sold. More so, if you get more than 100 valid Sales in one week, you will earn N1,500 per transaction generated the following week. 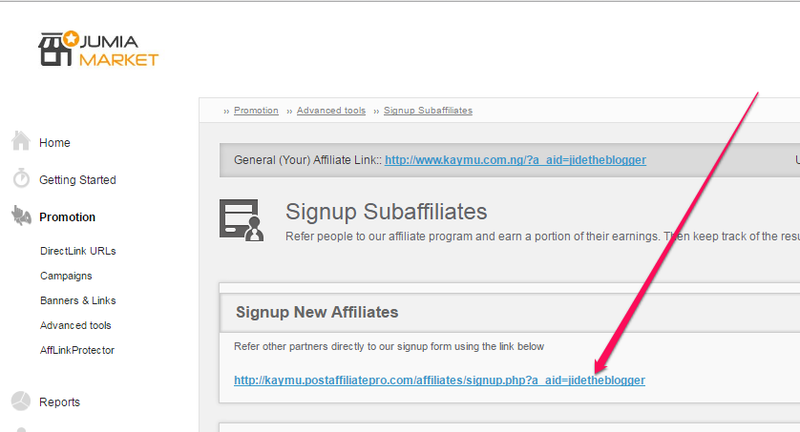 You can easily get the codes of the banners & links for your promotions via the ‘Promotion‘ tab on the affiliate dashboard. Minimum payout of Jumia market affiliate program is N5,000 but the Jumia market affiliate manager informed me this morning, that it has been reduced to N3,000 to enable more young bloggers raise money and make money online in Nigeria. The affiliate program features “Sub-Signup Stats” which allows you to view the downline of affiliates signed up under you as well as sales statistics of your sub-affiliates. If you would like to earn N300 per affiliate you refer, you will have to recruit affiliates by making use of your unique sub-affiliate signup referral link. You can get it by navigating to “Promotion’ > “Advanced Tools” > ‘Sign Up Sub-affiliates” after you signed in to your affiliate account. Copy, shorten it and start promoting it on your blog and your social media channels. You must not own a website to apply for this. In the area where you are required to input your website URL, if you don’t have a website provide a URL to your social media account, Facebook, Twitter, Instagram, etc. 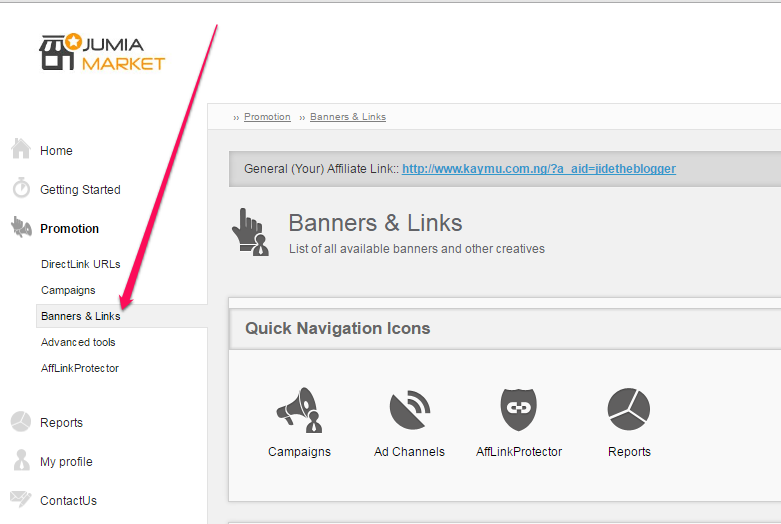 How Can I Sign In To My Jumia Market Affiliate Account? You can click here to sign in to your affiliate dashboard. Or click here. The Winner Of The 6 Months Data Giveaway Is? All Drones Must have visible license plates; Regulators. To give you information on free and affordable data plans so you don’t get ripped off by our internet service providers. So without further ado let’s get down to business. Open the app, then tap on Combo Settings and configure this way. Press Generate and Validate and Save. This works without data or Airtime 0.0k on your MTN line and it is capped. It is capped around 50Mb to 100Mb daily. It renews daily. If you are an mpulse user and you have mpulse data, then open the Combo app again and change the URL/host to mtn.pass.ng. I’m just making this post just for you . I won’t waste your time because I know you probably have a ton of other things to do so I’ll get straight to the point. Just give me a minute of your time. I’ve been running this blog for 3 years and I just started creating YouTube videos a couple of months ago and It’s not been easy. So this year I’ve embarked on a challenge and I need your help to get there. I’ve set out on a challenge to be the first Nigerian Tech YouTuber with a 100K subscribers. The biggest ones in the world have almost 10M . Help grow one of your own.. Let’s take this to the next level. All you have to do is click the subscribe button at the end of this post and share this post with your friends. Getting to 100k subscribers means I’ll be giving out a lot of free stuffs to those who subscribed to my channel also I’ll always be available if you need any tech help . Also you’ll be part of the 100k people who made this happen.